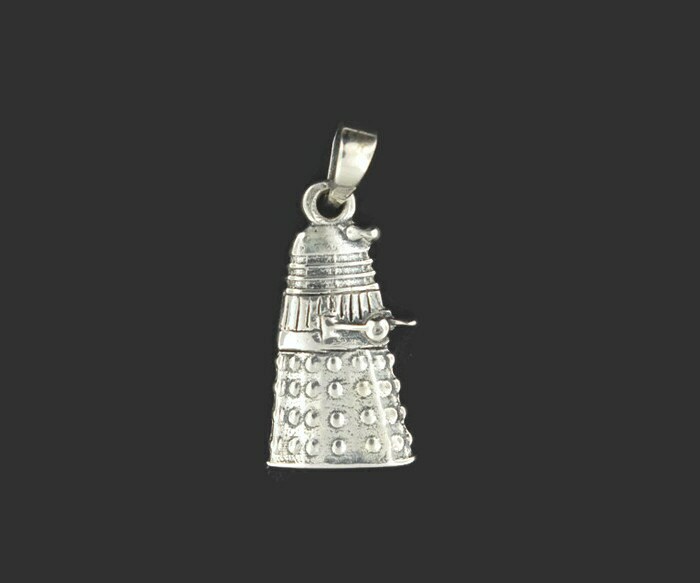 For all the fans of Dr. Who in my life, I made a small Dalek pendant in sterling silver just for you! The pendant is 2.25cm high plus the bail and 1.2cm wide. It is flat and one sided, but solid for every day wear and tear. Thank the Dalek that threatened to exterminate me in order for me to make it!!! This pendant is perfect! I love it. The details are spot on and the silver is beautiful. It has a nice weight to it too. I tend to buy expensive jewelry and this will easily look great on one of my chains. Also considering it for my charm bracelet. I don't say this much, but while I thought the picture was cute I was blown away when I saw it in person. The pic absolutely does not do it justice. Thank you! Love it. Thank u so much. Great service and product.